As our project grows, we will add details and links of relevant publications. Aporta, C., Kane, S.C. & Chircop, A. Shipping Corridors Through the Inuit Homeland. Limn. 2018. Summary Long before the waters and shores of what is known today as Canada’s Arctic archipelago were explored and surveyed, Europeans imagined a waterway connecting the Atlantic and Pacific oceans through or near the North Pole. But the archipelago shuttered hopes of easy passage. Its islands created conditions for longer sea-ice seasons and, together with continental shorelines, led to ice-clogged straits well into summer. Although the early European imagination lost out to geophysical reality, sea-ice melt accompanying 21st-century climate change has rekindled the prospect of navigation through the Northwest Passage. Projections indicate thinning ice in summer, sparking hopes for shorter inter-oceanic routes for cargo and new resource frontiers for mining, fishing, and the cruise-ship industry. Maritime administrators in the Canadian government have begun identifying corridors where shipping traffic may be directed, as well as areas and times where icebreaking would be necessary. However, this often has occurred without taking sufficient account of Inuit uses and understanding of these marine spaces. To embrace these worldviews is to fundamentally rethink the “frozen” nature of the Arctic archipelago and its many chokepoints. Peters, K., Steinberg, P. and Stratford, E. Territory Beyond Terra. Rowman & Littlefield International. 2018. Summary At the root of our understanding of territory is the concept of terra—land—a surface of fixed points with stable features that can be calculated, categorised, and controlled. But what of the many spaces on Earth that defy this simplistic characterisation: Oceans in which ‘places’ are continuously re-formed? Air that can never be fully contained? Watercourses that obtain their value by transcending boundaries? This book examines the politics of these spaces to shed light on the challenges of our increasingly dynamic world. 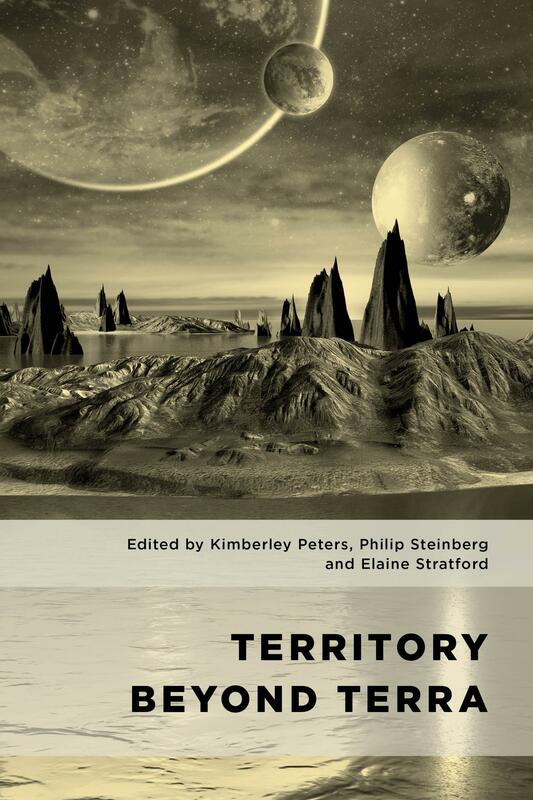 Through a focus on the planet’s elements, environments, and edges, the contributors to Territory beyond Terra extend our understanding of territory to the dynamic, contentious spaces of contemporary politics. Steinberg, P. and Williams-Reed, E. In a world of land and water, where does ice fit in? A report from the ICE LAW Project. Current developments in arctic law. 2018. Summary Ice complicates a world view where solid, stable land is positioned opposite liquid, mobile water. Ice melts and freezes; it breaks apart and moves; it has both land-like and water-like social properties; its edges are unclear. Ice is as challenging for international lawyers, boundary practitioners, and political theorists as it is for geoscientists and global environmental policymakers. The Project on Indeterminate and Changing Environments: Law, the Anthropocene, and the World (the ICE LAW Project) investigates the potential for a legal framework that acknowledges the complex geophysical environment in the world’s frozen regions and explores the impact that an ice-sensitive legal system would have on topics ranging from the everyday activities of Arctic residents to the territorial foundations of the modern state. This report will outline the background of the Project, as well as its objectives and structure, activities, and future plans. Bridge, G. & Bradshaw, M. Making a Global Gas Market: Territoriality and Production Networks in Liquefied Natural Gas. Economic Geography. 2017. Abstract Energy markets are an important contemporary site of economic globalization. In this article we use a global production network (GPN) approach to examine the evolutionary dynamics of the liquefied natural gas (LNG) sector and its role in an emerging global market for natural gas. We extend recent work in the relational economic geography literature on the organizational practices by which production networks are assembled and sustained over time and space; and we address a significantly underdeveloped aspect of GPN research by demonstrating the implications of these practices for the territoriality of GPNs. Koivurova, T., Tianbao, Q., Duyck, S. and Nykanen, T. Arctic Law and Governance. The Role of China and Finland. Hart Publishing. 2017. Summary The objective of this book is to identify similarities and differences between the positions of Finland (as an EU Member State) and China, on Arctic law and governance. The book compares Finnish and Chinese legal and policy stances in specific policy areas of relevance for the Arctic, including maritime sovereignty, scientific research, marine protected areas, the Svalbard Treaty and Arctic Council co-operation. Building on these findings, the book offers general conclusions on Finnish and Chinese approaches to Arctic governance and international law, as well as new theoretical insights on Arctic governance. Shake, K.L., Frey, K.E., Martin, D.G., and Steinberg, P. (Un)frozen Spaces: Exploring the Role of Sea Ice in the Marine Socio-legal Spaces of the Bering and Beaufort Seas. Journal of Borderlands Studies. 2017. Abstract Sea ice is a dynamic physical element of the greater Arctic marine system, one that has myriad connections to human systems on a variety of spatial and temporal scales. Changes to the spatial extent of sea ice simultaneously permits and endangers maritime operations, as well as impacts current debates over maritime boundaries, presenting an interesting challenge for international law. Sea ice is not a stationary object; it moves through time and space in response to the physical forces of wind, ocean currents, and heating. It has a tangible, material and substantive role in contestations over territory, resources and marine boundaries in both the Beaufort and Bering Seas. We suggest here that sea ice’s material nature in these marine regions continuously challenges stationary conceptions of law in complex and sometimes contradictory ways. Building on recent work on the human geographies of sea ice, the dynamic field of legal geography and recent contributions in ocean-space geography, we outline how the dynamism of sea ice could influence notions of boundary, resources and climate change in ocean-spaces of the greater Arctic region. Steinberg, P. & Kristoffersen, B. ‘The ice edge is lost … nature moved it’ mapping ice as state practice in the Canadian and Norwegian North. Transactions of the Institute of British Geographers. 2017. Abstract This paper explores how ‘ice’ is woven into the spaces and practices of the state in Norway and Canada and, specifically, how representations of the sea ice edge become political agents in that process. We focus in particular on how these states have used science to ‘map’ sea ice – both graphically and legally – over the past decades. This culminated with two maps produced in 2015, a Norwegian map that moved the Arctic sea-ice edge 70 km northward and a Canadian map that moved it 200 km southward. Using the maps and their genealogies to explore how designations of sea ice are entangled with political objectives (oil drilling in Norway, sovereignty claims in Canada), we place the maps within the more general tendency of states to assign fixed categories to portions of the earth’s surface and define distinct lines between them. We propose that the production of static ontologies through cartographic representations becomes particularly problematic in an icy environment of extraordinary temporal and spatial dynamism, where complex ocean–atmospheric processes and their biogeographic impacts are reduced to lines on a map. Elden, S. Legal Terrain: The Political Materiality of Territory. London Review of International Law. 2017. Abstract This lecture sketches the contours of a political-legal theory of terrain. It argues that terrain is a useful concept through which to think the materiality of territory. Terrain combines geophysical issues alongside strategic ones, and helps in attempts to develop a broader understanding of territory. Terrain makes possible, or constrains, various political, military and strategic projects; dynamic geophysical features of the earth complicate political-legal understandings. Terrain is where the geopolitical and the geophysical meet, and the lecture suggests that it is a helpful concept for making political-legal understandings of territory better account for the complexities of the geophysical. Aporta, C., Taylor, F., Laidler, G. Inuit Geographies of Sea Ice. Special Issue of The Canadian Geographer. 2011. Summary In this special issue, we present insights that Inuit hunters have shared with us about what declining sea ice means to them, reflecting different perspectives that emerge from different communities. However, these narratives also share the following traits: sea ice is becoming less predictable, travelling and hunting on moving ice or at the floe edge has become more hazardous, the seasons of sea ice use are shortening, the sea ice is thinning, and there is concern for the safety of younger generations who are less knowledgeable about sea ice terminology and processes. Chircop, A., Moreira, A.W., Kindred, H.M. and Gold, E. Canadian Maritime Law. Second Edition. Irwin Law. 2016. Summary Canadian Maritime Law is the leading scholarly text and reference work on maritime law in Canada. It covers the full scope of admiralty, shipping, and navigation issues in the Canadian and international contexts. Since the first edition, maritime law as legislated, judicially developed, and practised in Canada has evolved substantially. Four editors led a team of twenty-eight scholars, practitioners, and other field specialists from across Canada to produce a comprehensive text accompanied by extensive lists of legislation, international treaties, and cases, along with a detailed index. Coddington, K. S. Spectral geographies: haunting and everyday state practices in colonial and present-day Alaska. Social & Cultural Geography. 2011. Shadian, J. M. The Politics of Arctic Sovereignty: Oil, Ice, and Inuit Governance Routledge. 2014. Summary Interest in Arctic politics is on the rise. While recent accounts of the topic place much emphasis on climate change or a new geopolitics of the region, the history of the Inuit Circumpolar Council (ICC) and Arctic politics reaches back much further in time. Drawing out the complex relationship between domestic, Arctic, international and transnational Inuit politics, this book is the first in-depth account of the political history of the ICC. It recognises the politics of Inuit and the Arctic as longstanding and intricate elements of international relations. Beginning with European exploration of the region and concluding with recent debates over ownership of the Arctic, the book unfolds the history of a polity that has overcome colonization and attempted assimilation to emerge as a political actor which has influenced both Artic and global governance. Steinberg, P.E., Tasch, J. & Gerhardt, H. Contesting the Arctic: Politics and Imaginaries in the Circumpolar North I.B. Tauris. 2015. Summary As climate change makes the Arctic a region of key political interest, so questions of sovereignty are once more drawing international attention. The promise of new sources of mineral wealth and energy, and of new transportation routes, has seen countries expand their sovereignty claims. Increasingly, interested parties from both within and beyond the region, including states, indigenous groups, corporate organizations, and NGOs and are pursuing their visions for the Arctic. What form of political organization should prevail? Contesting the Arctic provides a map of potential governance options for the Arctic and addresses and evaluates the ways in which Arctic stakeholders throughout the region are seeking to pursue them.